The hardest part of creating a silent film score for DVD/Blu-ray release is that you’re composing-improvising-performing the score in a vacuum. You’re not recording in the same environment that you perform in, the one where a factor is the Venn-diagram overlap of audience, big screen image, and accompanist. You can’t have a couple hundred people over while you workshop or record the music. But there’s a next best option. It doesn’t happen often. Sometimes I’m able to engineer it, but sometimes it also just lines itself up. Getting to play for a film that I’m about to score for video at a show, especially one I haven’t seen or haven’t accompanied for an audience before, helps inform my scoring and playing. This happened a few years ago with Marion Davies’ The Bride’s Play (1922). In early 2016, for his 5th silent film Kickstarter, Edward Lorusso had chosen the Marion Davies film The Bride’s Play. Ed and I had been in touch, comparing notes on doing these kind of projects, and he’d approached me about scoring this one. His crowd-funding campaign ran (successfully) in May-June 2016. The film would be coming from the Library of Congress, a new scan off the LoC’s 35mm preservation negative made from a nitrate print Ms. Davies gave to the Library decades ago. Concurrently, Rachel Del Gaudio and Rob Stone, the organizers behind Mostly Lost, the Library of Congress’ annual film identification workshop, were selecting films for the evening screenings that were open to the public. The Bride’s Play was an ideal fit for the criteria of showing something that had never been available on home video and had not been shown publicly before. The Bride’s Play had been preserved, but there was no show print anyone could book for screenings. The film was selected for the final night’s evening of rare silent films, and was scanned, graded, and prepared digitally for the show. As it turned out that year, I got to play for the show. There are three of us who accompany the silent unidentified films during the day — me, Philip Carli and Andrew E. Simpson — and who plays the closing night show rotates every year. The Bride’s Play, being about an hour long, was paired with a hilarious five-reel comedy feature starring Douglas MacLean called Bell Boy 13. Ed’s plan was to send DVD copies of The Bride’s Play, with my recorded score on it, to his backers in the early fall of 2016, a couple months after the Mostly Lost screening. A few days before the Mostly Lost workshop got under way that year I had a chance to preview the new digital version and take some notes on the story, moods, scene shifts and the one or two surprise moments. A few days later, on the closing night of the workshop, I performed my new improvised score to an audience of a few hundred people at the State Theater in Culpeper VA. Both The Bride’s Play and Bell Boy 13 went over really well, and while I was playing for the Marion Davies picture I tried to make mental notes of how scenes were going both musically and in terms of what I was taking in out of the corner of my mind from the audience vibe that fed my music creation. A month or so later, when I laid down my piano score for Ed’s Kickstarter DVD project, I was able to recall not only some of the musical ideas and themes that came out of my hands during the show, but also almost a sense-memory of how they felt with an audience as I did the recording, in that vacuum. I don’t know if the score I recorded is any better than it would have been without my live experience playing to it, but I like to think it may be. This is the score you hear on the version that Ed licensed to TCM and which I released in 2017 on my Undercrank Productions DVD label. 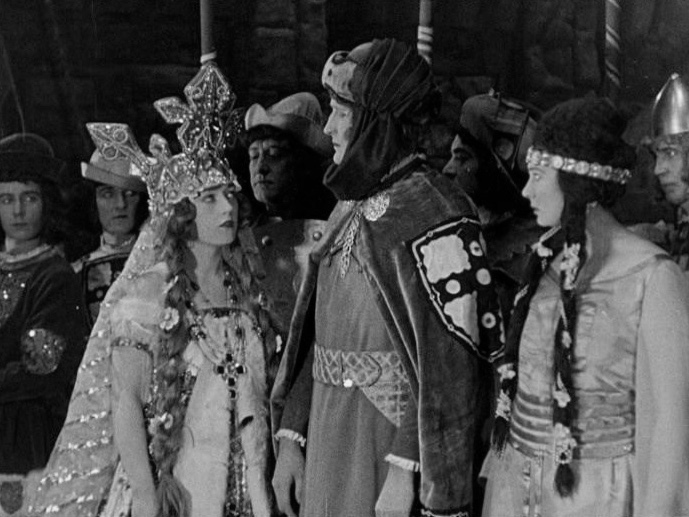 The Bride’s Play airs/aired on TCM’s Silent Sunday Night for St. Patrick’s Day in 2019, and in 2018 during their “Summer Under the Stars” day of Marion Davies films. You can buy the Undercrank Prods. DVD release here and on several other online retailers like TCM Shop and DeepDiscount. Episode 23 of my Silent Film Music Podcast covers a similar experience I had scoring W.C. Fields’ It’s The Old Army Game for KinoLorber. Learn more about the Mostly Lost workshop, which will be held next on June 12-15, 2019, here. The Bride’s Play is available on Amazon and other online retailers.